Even though active learning is far more potent than passive lectures, I love to listen to something captivating while walking to and from work. 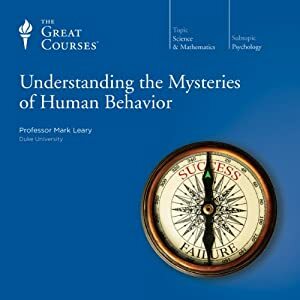 So I’ve slowly been making my way through the Great Courses series, a series of university lecture packages available on the audobook marketplace Audible. I suppose if my goal in this were to learn as much as possible I could choose a much different approach, but the main goal is entertainment. Nonetheless, I’ve included some thoughts in each of the reviews below about how memorable the content was; how much it left me thinking for days after words. Those situations, when a lecture makes me reflect or reconsider the world in some way, are the real benefit (in my opinion). In the following list of Great Courses, I’ve only included those lectures which I found to be compelling and memorable. 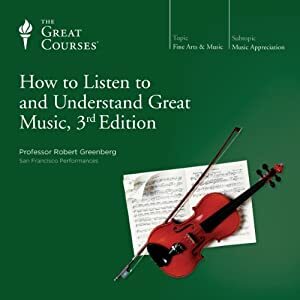 How to Listen To and Understand Great Music, 3rd Edition : these lectures deal primarily with what most of us would call “classical” or “chamber” music. Spanning hundreds of years of content, it breaks down the sounds and ideas of great music through the ages to place it within a historical context. For example, you’ll learn how Gregorian chants are connected with the church, or how technological innovations influenced the sounds of the orchestra. 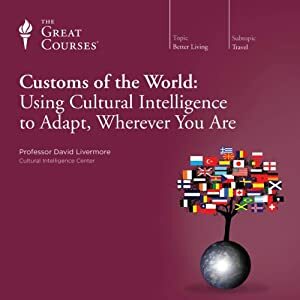 Customs of the World: Using Cultural Intelligence to Adapt, Wherever You Are : placing this course inside the “business” category feels a bit weird to me, but nonetheless it’s a fascinating breakdown of the different cultures of the world on a collection of different axes. If you’ve traveled a lot, you’ll find yourself nodding along to some of the observations that are made. The lecturer provides a foundation upon which to connect with and understand with people around the globe. 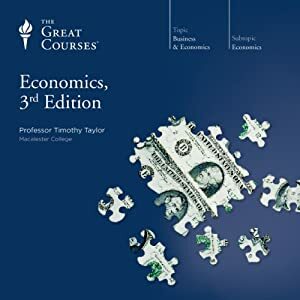 Economics, 3rd Edition : having a basic understanding how the monetary system works is very useful these days, given how convoluted it has become. This introduction to economics covers everything from employment and interest rates to personal and global economic issues. It can help you make wiser decisions with your own money, as well as explain how the world economy works at-scale. Nutrition Made Clear : despite all the progress which has been made in science, nutrition is one of the fields that is still laden with misinformation and superstition. This course attempts to demystify nutritional science and provide a groundwork upon which the listener can base lifestyle decisions. 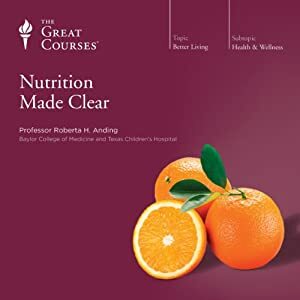 It’s a very sobering and helpful guide through the fields of diet and health; if you’ve ever been frustrated by the latest fad diet craze or wanted to understand true health, check this course out. 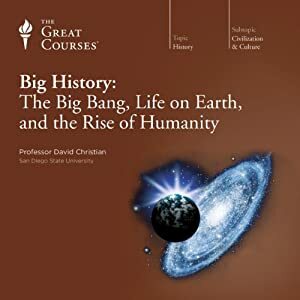 Big History: the Big Bang, Life on Earth, and the Rise of Humanity : the subject matter of this course is, as the name would imply, big. It covers history at such a macro-level as to be staggering, but also zooms in to some of the key events of humanity’s past. It’s a truly inter-disciplinary look into the world of yesterday and of tomorrow, a wonderful primer into each subject that made me curious. I found it to be a captivating journey, albeit rushed (and necessarily so). If you’re really looking for the big picture of, well, everything… prepare to have your mind blown. This is also a great introduction into a huge number of different topics, from many branches of physics to anthropology and other fascinating diversions. History’s Great Voyages of Exploration: just what makes an explorer? It’s a romantic trade, conquering everything from the frontiers of science to the edge of the world and the vastness of space. 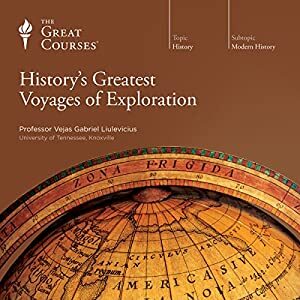 In this course, the great exploratory journeys of history are examined and re-lived. Aside from providing some good stories, the series of lectures ends up making a case for the importance of exploration. I found that I came away with a desire to search and to explore, while also fascinated by some of the journeys that had been made by explorers of ages past. The course traverses the arctic, the ocean, and even the test tube. 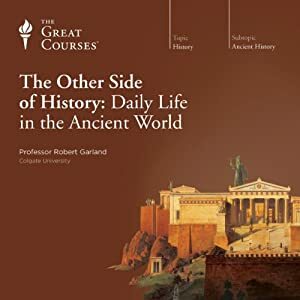 The Other Side of History: Daily Life in the Ancient World : what was it like for a common person at each significant age and location in history? That is the driving question which fuels the fascinating investigation of each lecture in this series. I found myself absolutely absorbed by these tales of what daily life would have been like for the people not told about in the history books, and feel like I have a much better appreciation for the significance of history as a result. If you like fantasy books, you’ll love this. It feels like what Tolkein or George R.R. Martin would listen to in order to get inspired to do their worldbuilding. 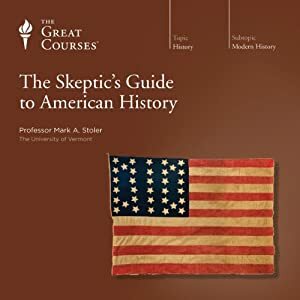 The Skeptic’s Guide to American History : relying on the narrative tool of a series of debunked myths in each lecture, this course seeks to correct some common misconceptions of the history of the United States of America. It felt like it was aimed more at history buffs as it’s core audience. While it was entertaining for a non-historian, I sometimes had to admit that I lacked sufficient knowledge of history to truly appreciate it. That said, there are a great number of amusing factoids in this one. 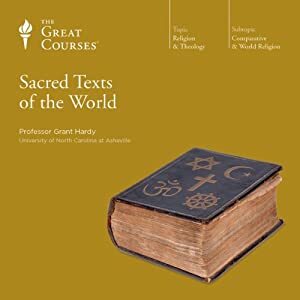 Sacred Texts of the World : this course might seem stuffy and dry, but that’s anything but the case. The lecturer brings ancient and modern cultures to life by exploring the texts which they hold dear, using it to infer lessons about their values and societal structure. It’s not so much of a religious exploration, in my mind, as a cultural one, shining light on the different ways humans approach things like mortality, morality, and so on. 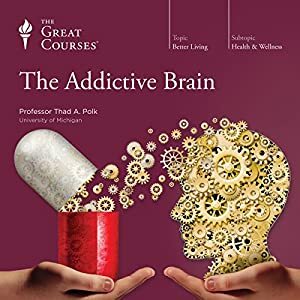 The Addictive Brain : this series starts with the understanding that we adults consume a great number of drugs, legal and otherwise, and it’s worth trying to grasp what they’re going. The hard truth of the fact is that addiction is not a moral failing, as society commonly treats it, but a neurological condition. This has drastic policy and personal implications. For me, thinking about these broad ramifications of a seemingly simple problem was the most enjoyable part of this course. The Higgs Boson and Beyond : if you watch science news in any way, you’ve probably heard of the Higgs Boson. 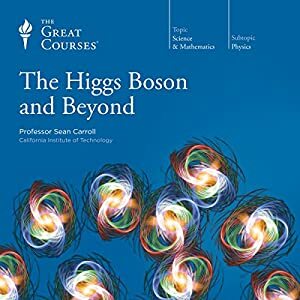 It was theorized for many years before being ostensibly discovered at CERN, and has been called “the god particle.” This course builds up an understanding of why the discovery was significant, delving into a bit of science and culture. It’s a good overview of the importance of this landmark event, as well as an introductory look at some key concepts in modern physics. Though it tries to stay away from getting technical, there’s no avoiding the fact that this course will not be for everybody. Someday, it’s a topic I hope to revisit and develop some true understanding of, but this is a great groundwork at the least. Give this course a shot, and even if it’s not your cup of tea you will still have something to share with friends. 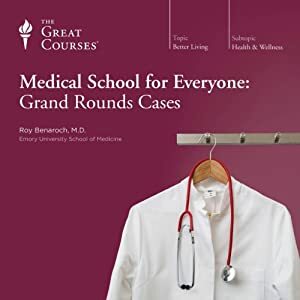 Medical School for Everyone: Grand Rounds Cases : have you ever wanted to play Dr. House? In this series, you’ll get to follow along like a fly on the wall for some fascinating and real medical cases. The lectures not aimed at medical students, which means it’s accessible for even the layperson to understand how doctors make the important and life-saving decisions which they are faced with each day. As a bonus, it’ll help you develop a better relationship with your own health. This is one of those courses that I’d recommend for absolutely everybody. It provides a basic ability to rationally self-diagnose, to a limited degree, and know how to approach medical situations which can otherwise be confusing or even scary. Ride along for these lectures and be a doctor for a day or two; don’t be surprised if you find a fascination you never imagined with the medical profession. 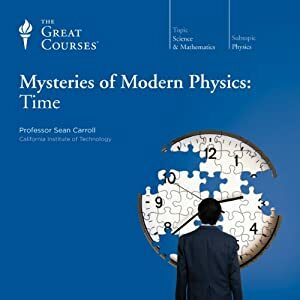 Mysteries of Modern Physics: Time : time is a really, really weird thing. If you’ve read even a basic introduction to the theory of relativity, you know that time can be bent and warped… and that’s just the beginning. This course explores all of the oddities that go along with this idea which we take for granted. There are some mind-blowing and downright philosophical moments, even though it’s all built upon science. Stress and Your Body : people these days are under a lot of stress. We’ve created an environment which creates a persistent state of stress, instead of the “fight or flight” stress of our ancestors. 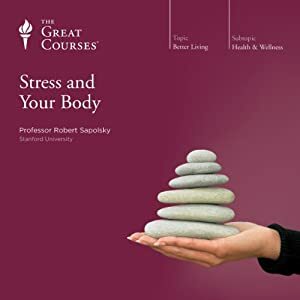 This course looks at the long-term health impacts of such sustained stress, explaining in detail how it can impact our lives, and tries to provide a foundation for mitigating the litany of negative effects so that you can self-manage stress. Understanding the Mysteries of Human Behavior : why do we do the things that we do? Inside this course lies some strange and intriguing answers. If you’re a fan of behavioral economists like Daniel Kahneman or Dan Ariely, you’ll certainly find this series of lectures interesting. If you have an interest in understanding yourself and others better, this course is both a great starting place and a valuable resource for self-improvement. 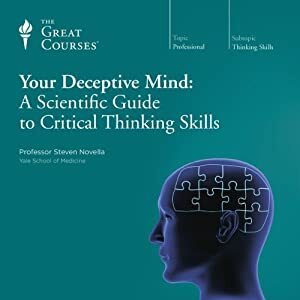 Your Deceptive Mind: A Scientific Guide to Critical Thinking Skills : when considering the merits of one side or another of an argument, how do you determine when something went wrong? This series explores logical fallacies, like “moving the goalposts” or “the naturalistic fallacies,” so that you can see where ideas and arguments go astray. You’ll come away with the tools to know when you should be confident, and when not. Dr. Steven Novella is also the host of the Skeptics Guide to the Universe. 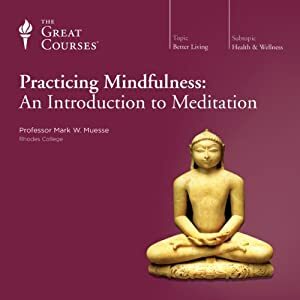 Practicing Mindfulness: An Introduction to Meditation : no matter if you’ve new to meditation or an experienced practitioner, if you want to learn more about mindfulness this course will be interesting. It delves into practice and application, as well as some of the research and health benefits to a consistent mindfulness practice. I found it to be a practical approach to a topic which is generally surrounded by a lot of vagaries. The instruction in meditation practices was not particuarily useful for me, as I already had my own daily meditative practice and felt that the books and teachers I had worked with were better than the academic instruction offered in this course. Still, for those not yet exposed to meditation, this might be just the introduction that convinces you… and for those already practiced, the research is interesting.